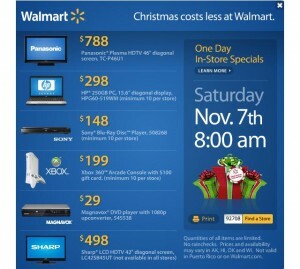 This weekend, Saturday November 7th 2009, Walmart will be selling their Xbox 360 Arcade units for $199, which is the regular price. But the sweet part is that they are also handing a $100 gift card with it, so you are really getting the console for only $99. If you have been looking into getting a console, Christmas has come early for you! Halloween is over and the holiday season is quickly approaching and we all know what that means, time to go out and shop for xmas gifts for friends and family. There are plenty of reasons you should start planning your holiday shopping early and save up some money for Christmas, no matter how big or small your Christmas gift list is going to be. To find the best Christmas gifts you need to keep a watchful eye out sooner rather then later; and hopefully our blog post can help you find the best Christmas gifts this 2009 season!